Even though TLA conference week is crazy busy, I still find time to follow some of the links in my Twitter feed. This one (http://blogs.edweek.org/edweek/curriculum/2016/04/common_core_curricula_teacher_materials.html?cmp=soc-edit-tw) from Education Week was a blog posting about where teachers fun the materials they were using for CCSS. Curious minds want to know. I want to know. So, here is the information about ELA resources for CCSS. It is heartening to see 90%+ of teachers surveyed using materials they developed themselves. What was disheartening, though, was how many programs were sources for CCSS including Accelerated Reader (how does a quiz program meets any of the standards, I wonder, unless it is a standard about reading for trivialized details?). The other disheartening fact: while 90%+ of elementary teachers use trade books only about 50% of secondary teachers use trade books. Honestly, I want to weep when I see that kind od drop off in using real books. How can kids become LIFE ready if they do not read REAL books? 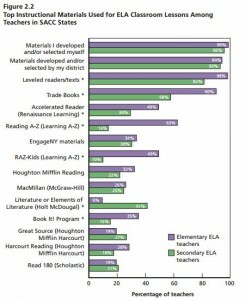 Here is another chart from the article showing online resources consulted for materials for CCSS. IMHO, the sites that should be ranked near the top are NCTE (our professional organization) and Read.Write.Think. Instead Pinterest is near the top as is Teachers Paying Teachers. Pinterest? Really? I suggest reading Donalyn Miller's piece from the Texas Library Journal called INTEREST ISN'T PEDAGOGY: http://www.txla.org/pinterest-isnt-pedagogy. For the life of me, I fail to understand teachers who are not active professionally, who do to read professional journals, who do not take advantage of the information offered by professional organizations. Yes, yes, I know that the cost of being professional is considered by some to be a good reason NOT to be active professionally. But many organizations offer discounts for students. Many organizations are making parts of their publications available online. Check out the ALAN materials: http://www.alan-ya.org/publications/the-alan-review/the-alan-review-columns/. After a day of conference during which I filled a bag with ARCS, met new authors, hugged former and current students, and walked 3 miles looking at all that was available to read, I know that the cost of membership and registration is totally worth it. I cannot imagine what I would miss were it not for my professional ties. There are many who look at what I do and think, that looks easy. I know my own former residents of the back room thought my job was easy at the university. People who attend my sessions always tell me they want my job. If I make it look easy, I have accomplished much. But I can tell you that making something look easy requires a LOT of preparation. When I watch the cooking shows, I am always a bit amazed at the 15 minute meals. And then I look critically and think--hey, who shredded the cheese, who cut the veggies you threw into the pan, who remembered to defrost the meat, what happened when you THOUGHT you had a jar of sauce and discovered someone had used it already? Those questions reflect the reality and are not included in the 15 minutes the meal took to prepare. And so it is with my job. Students are already clamoring for information about summer classes. I have posted reading lists. I have the other materials all ready to launch soon online. My panel moderator duties for tomorrow and Saturday have been completed and stored to my Google drive. Prepare for my presentations and, like my pals Karin Perry and Donalyn Miller, now tweak slides incessantly and obsessively. When it is all prepared, it should look easy; it should be fun. But behind the scenes, the work is a bit tougher. And much more rewarding because of that.